A good news for CDMA network users as they now have one more option to select their smartphone. This smartphone from the South korea's manufacturer is available at @ $ 180 on www.boostmobile.com. Samsung Galaxy Prevail 2 is a 3G single sim smartphone with a TFT Capacitive front panel with multi touch that measures 4 Inch diagonally. This WVGA display of this smartphone sports a resolution of 480 x 800 Pixels, ~233 ppi pixels density, 16 M Colours. Dimensionally Samsung Galaxy Prevail 2 measures 122 x 63.5 x 12.7 mm (4.80 x 2.50 x 0.50 in), weighs mere 130.4 gms (4.59 oz) & there are two colour options in which this smartphone is available viz; White & Gray. Samsung Galaxy Prevail 2 features a hard button at the center of the bottom on the front panel with two capacitive buttons on both the sided for menu & back. On the left side of the bezel there is a hard button volume key which can also double up for camera zoom & below the volume button that is a slot for microSD card. On the top there is a microUSB slot & 3.5 mm audio jack & on the right side of the bezel is the power button. Under the skin Samsung Galaxy Prevail 2 holds a single core 1.4 GHz Processor, Qualcomm MSM8655 Snapdragon Chipset, Adreno 205 GPU, 512 MB RAM. Technically this smartphone is moderately loaded, but keeping in mind the budgeted level at which it is offered it is fine. 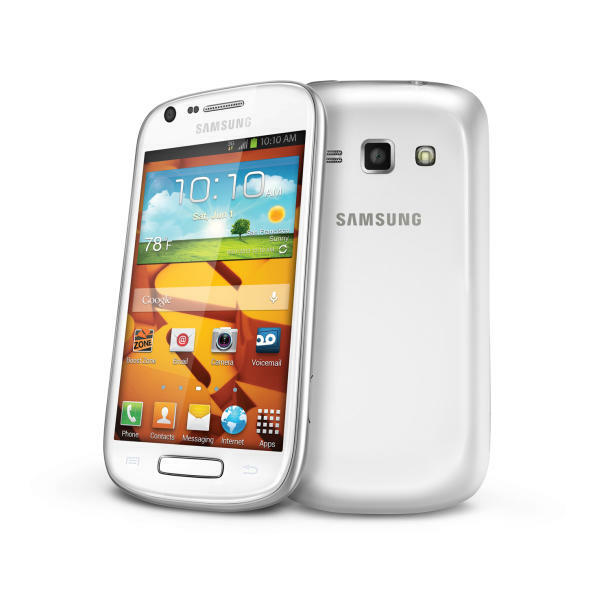 Samsung Galaxy Prevail 2 will come out of the box with Android OS v4.1 (Jelly Bean). The 4 GB internal memory of this smartphone is a bit disappointing as nowadays some of the games & apps use up a large disk space. It has covered up for the lag by providing a microSD card slot that supports upto 32 GB card. So you will have to install some good app to manage the internal memory disk space by moving them to the memory card. The primary snapper of Samsung Galaxy Prevail 2 is of 5 MP with LED flash light, auto focus, geo tagging, touch focus, smile detection, panorama. This shooter is capable of clicking images of 2592 x 1944 Pixels & record videos of 720 P @ 30 fps. The secondary snapper is of 1.3 MP for video chatting. On the data connectivity aspect this smartphone features Wifi, Bluetooth v4.0 A2DP, microUSB v2.0, GPS with support for A GPS. The Li-ion battery of Samsung Galaxy Prevail 2 packs a juice of 1750 mAh.